A new citizen votes in North Carolina, big turnout in the Philadelphia suburbs and voting from a bathroom in Michigan. Thanks so much, everyone, for sending in your accounts from the polls. We've been flooded with them, so if you don't see your story here or in one of the posts that's still to come, our apologies -- there just wasn't room to get for everyone, and we tried to focus on people writing in from potential swing states. Here's one great e-mail; after the jump, there are four more. While standing in line this morning, an older African-American woman stood in front of me. The poll workers were bringing groups of 30 into a small elementary school gym but as we were being guided forward, the woman hesitated and moved behind me. I asked if she wanted to take back her place in line. "Oh, no, no," she replied in a heavy Caribbean accent, "I'm just so nervous. It's my first time voting. I don't know what to do." As we began filling out forms and such, I asked her if her nerves had calmed down yet. She showed me her voting form. Her name looked like she had written it with a vibrating pen. I watched as the poll workers patiently helped her with the machine. Others smiled and congratulated her on her first election as a U.S. citizen. I don't know about other precincts in North Carolina, but mine was hopeful, peaceful, respectful and diverse. I, too, was nervous casting my vote this morning -- even thought I've been doing it for years. I guess it doesn't matter if it's your first time or your fiftieth, voting still means something. Today it felt like everything. I just returned from my polling place in the Philadelphia Suburbs.I've never seen such turnout. The line was down the hall, out the door, all the way to the far end of the building and occasionally threatened to stretch around the corner. It took me 1.5 hours start to finish. I'm 8.5 months pregnant at the moment and waiting in line for a long time is physically very difficult but all the volunteers bent over backwards to help me stay comfortable. Instead of becoming impatient with the wait, people seemed to be positively giddy about it. I could hear people saying "This is history!" and "Take a picture of me with my daughter, I never want her to forget that She Was There!" At one point a poll worker escorted a couple to the front of the line saying, "See here everybody, this is what 96 looks like, isn't it beautiful!" and an elderly, well dressed african american couple shuffled forward. The husband smiled and, putting his hands in the ai, called out, "Amen! God Bless all of you for being here!" Everyone applauded. 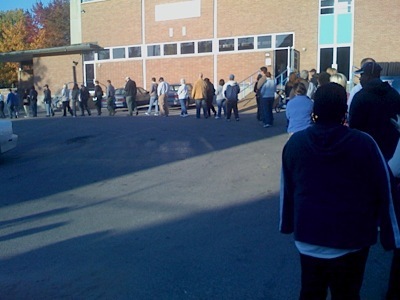 My wife, daughter and I arrived at the polls about 6:40am, 20 minutes before they opened, and the line was already out to the road from the HS gym. We only have one polling location in town and it becomes a logistical nightmare. After we voted and were driving home the backup to get to the HS was already a mile long and cars were turning around and giving up. In a town of at least 12,000 registered voters, probably more, we desperately need more than one polling location. There was another serious bottle neck trying to get out after filling out the ballot - only two optical scanning machines. People where literally going around in circles trying to line up and get out. Extremely un-organized. I'm just glad I got in early. I live in rural Michigan. I have never had to wait in line to vote. When I showed up this morning at 7am the line was 20 deep. When I got inside there were only 4 spots to fill in your ballot. To keep things moving they were directing people to the attached men's and women's bathroom to fill in their ballot. So I filled in my ballot in a bathroom sitting on the can. It was great to see that kind of voter turnout. Seems like a huge turnout in the city of St. Louis. This is the view of the line at my polling place at 7:30 this morning, which snaked around a parking lot and down the street and around the corner. By far the longest line I've seen in 28 years of voting--with many more young people and African-American voters than I've ever seen. The hour and a half I spent in line was the most uplifting and hopeful hour and a half I've spent recently. Here is a photo I took.